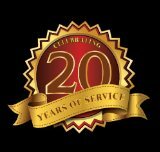 FREE ASSEMBLY ON EVERY GRILL PURCHASE! 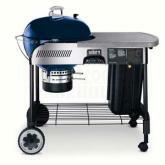 This Charcoal Grill Features: 22.5 inch porcelain enameled bowl and lid, Cooking area = 363 sqin.. Heavy duty plated steel hinged cooking grate, Touch-N-Go gas ignition system, Factory assembled stainless steel One-Touch cleaning system with removable black aluminum ash catcher, Tuck-Away lid holder, Dual purpose thermometer, No rust aluminum vent, Weather protected CharBin storage container, Thermoset work table, One glass reinforced nylon handle, Two Char-Basket charcoal fuel holders, Two crackproof all weather wheels, Two locking casters, Heavy duty steel cart frame, Wire bottom shelf, three tool hooks, uses disposable 14.1 or 16.4 ounce LP cylinders, Weber cookbook. Note: 14.1 ounce tanks provide up to 12, 10-minute ignitions and 16.4 ounce tanks provide up to 14, 10-minute ignitions. 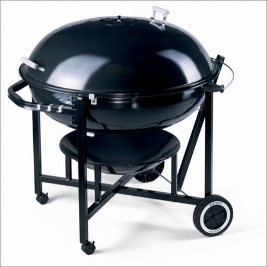 This charcoal grill features: Porcelain enameled bowl and lid, 22.5 inch cooking area = 363 sqin. 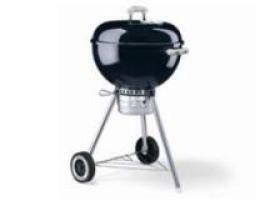 Heavy duty plated steel hinged cooking grate, Factory assembled stainless steel, One-Touch cleaning system, Removable high capacity ash catcher, No rust aluminum vent, Three glass reinforced nylon handles, Crackproof all weather Wheels, Weber cookbook. Legendary grilling. 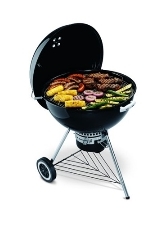 This grill features: 26.75 inch porcelain enameled bowl and lid, Cooking area = 508 sqin. 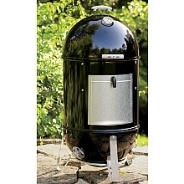 Stainless steel hinged cooking grate, Factory assembled stainless steel One-Touch cleaning system, Removable high capacity ash catcher, Tuck-Away lid holder, No rust aluminum vent, Built-in thermometer, Heat resistant handle design, Three glass-reinforced nylon handles, Two Char-Basket Charcoal fuel holders, Crackproof all weather wheels, Weber cookbook. Height 42" - Width 37.75" - Depth 44.75"
Slow cook roast, turkeys, hams and whole fish. This grill Features: Porcelain enameled bowl, lid and water pan. Cooking area = 726 square inches, Two heavy duty plated steel cooking grates, Lid thermometer, Two glass reinforced nylon handles, Four no rust aluminum vents, No rust aluminum fuel door, Premium grade cover included, Weber cookbook.